I can see that until someone reaches a stage of receptivity, reading the sutras is very difficult. I've been practicing almost a year and I've just started reading them in the last month. I tried before but it seemed "boring" and "too hard." I just wasn't in the right mental space for it. Thank you for sharing this, I think most people, like me find the sutra part of practice a chore till they don't. And then the Sutras become just interesting. Now I don't know how I ever thought they were boring. "As I do not quite understand the meaning of the Sutra I recite, I am doubtful as to its proper interpretation. With your profound knowledge and high wisdom, will you kindly give me a short explanation?" "Fa Da, the Law is quite clear; it is only your mind that is not clear. The Sutra is free from doubtful passages; it is only your mind that makes them doubtful. In reciting the Sutra, do you know its principal object?" 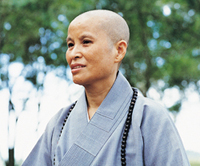 "If that is so, we have only to know the meaning of the Sutra and there would be no necessity for us to recite it. Is that right, Sir?" If that were so, then neither would it be right for us to speak, since speech forms the substance of literature. He would also argue that in the direct method (literally, the straight Path) literature is discarded. But does he appreciate that the two words 'is discarded' are also literature? Upon hearing others speak of Sutras, such a man would criticize the speakers as 'addicted to scriptural authority'. It is bad enough for him to confine this mistaken notion to himself, but in addition, he blasphemes against the Buddhist scriptures. You men should know that it is a serious offence to speak ill of the Sutras, for the consequence is grave indeed! "He who believes in the reality of outward objects tries to seek the form (from without) by practicing a certain system of doctrine. He may furnish spacious lecture-halls for the discussion of Realism or Nihilism, but such a man will not for numerous Kalpas realize the Essence of Mind. "Good men, the Scriptures expounded by the Thus Come One are all for the purpose of saving and emancipating living beings. Sometimes I speak of myself, sometimes of others: sometimes I present myself, sometimes others; sometimes I show my own actions, sometimes those of others. All that I preach is true and not false. I feel that in tibetan buddhism not so much emphasis is put on studying the scriptures, commentaries seem to be preferred. However quotes from sutras are usually abundant in the commentaries. Thank you for sharing. I enjoy reading scriptures and try to make sense out of it. I could not make any sense of scriptures without teachers. I would be completely helpless without them. I don't find the Pali Canon difficult. Some of the others I classify in one of two ways; there are Buddhists texts, I won't name names, that are very metaphysical and difficult to understand, sometimes that's because the writers were being precise about something very specific and useful but difficult to define, and sometimes it's because their ideas are balanced in an ontological framework that no longer exists in the collective consciousness (I don't use that term in any psychic way) or was created to be obscure because the writer wanted recognition but didn't possess insight or depth of understanding. That's a polite way of putting it. Sorry, but I've been a critical reader all my life, and that's my interpretation of why some texts 'don't work' for me and many others. Now some texts I do understand only too well, but not on their own terms. Some texts use various devices known to advertisers, other religions, propaganda machines etc etc. They employ loaded questions, poisonings of the well and other ad-hominem logical fallacies to attack their opponents - confusing since often their opponents have vanished into history, leaving us with unbalanced writing. They employ tautologies, what I will call 'appeals to grandiosity of imagery', Emperor's New Clothes arguments (only wise/brave/high quality people can understand this...), chain letter type threats e.g. 'spread this sutra and you will be enlightened very soon, disparage it and you will die!'... (...idiots. I hate chain letters), and, oddly for Buddhism, homunculus arguments, to support their own poorly defined ideas, or actually, usually not their ideas but their desire to increase support for their sectarian missions. As I say, I'm not naming names; some of these texts are modern, some are archaic. The Pali Canon, on the other hand, while not perfect and containing occasionally dubious passages that seem off message (some of the comments on women, for instance), is clearly based on a highly intelligent and focussed person's attempt to create a foolproof and methodically explained guide to enlightenment, the text using techniques of repetition both as an oral tradition's mnemonic device and also a learning aid for the reader, who I think Buddha realised would find many ideas counter-intuitive and would require said ideas to be effectively reinforced. Buddha tried to exhaustively detail the possibilities and questions arising from his ideas, while humbly recognising that he wasn't able to do this completely and asking us to investigate for ourselves, at the same advising us not to get too attached to the myriad spurious trains of thought that may arise from them. He uses imagery as analogy, not for shock and awe effect, he dismantles the logical fallacies of others, of the mind, rather than introducing those of his own in support of his assertions. When reading the Pali Canon, I, who have never been particularly star struck or respectful of 'world honoured ones', find myself seeing Buddha as a person; not someone 'special' in any magical sense, but someone I both like and respect and am prepared to listen to. That's what I read between the lines here. Can I just add, hours later, that I didn't check which forum this was, I just clicked on the title because I thought I could contribute something useful, and I find it's the Mahayana one. So it sounds a bit like I'm praising the Pali Canon as an attack on The Mahayana - I'm not, and just to clarify, there are plenty of Mahayana writings that are extremely helpful and don't fit into the problem categories I define above. When reading the Pali Canon, I, who have never been particularly star struck or respectful of 'world honoured ones', find myself seeing Buddha as a person; not someone 'special' in any magical sense, but someone I both like and respect and am prepared to listen to. I don't know why, this reminded me so much of Martin Luther. Hmmm. Apart from the anti-semitism, not an unflattering comparison... I think Luther would definitely have regarded Jesus as 'magic' though. Just to clarify, it's not that magic doesn't exist, more that a sunrise or peal of laughter is just as magical as levitation or what-have-you. I suppose what I mean is that Siddhartha comes through as a person, a very approachable one at that, warm and witty and quite beautiful in his affection for others, certainly not some horrible idealised razor's edge of perfection. certainly not some horrible idealised razor's edge of perfection.